As longtime residents and parents of children who attend the Hoboken Public School District, we can speak firsthand to the quality of education and opportunity provided to district students. 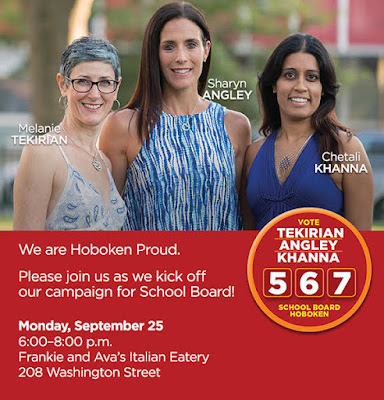 We are running for election to the Hoboken Board of Education. Our mission is to raise awareness of the many great things happening across the district today and to work constructively with the administration on further enhancing public education in Hoboken. Our goal is that our elementary and middle schools be urban schools of excellence and Hoboken High School to be our communities’ No.1 choice for grades 9-12. Please join with us in this effort. We look forward to seeing you on Monday.